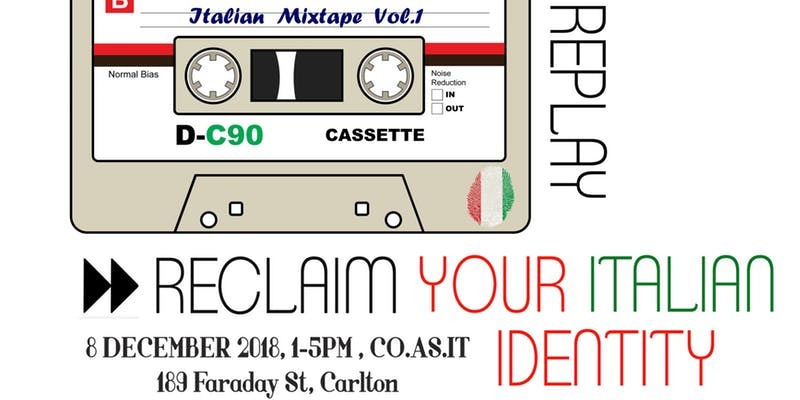 Remix/replay/reclaim is a workshop for young Australians of Italian ancestry. If you are an Australian of Italian background, and you are 18 to 28 years old, this workshop is for you! Enjoy a light lunch and drinks, meet with other young Italo-Australians, and explore new ways of remixing, replaying and reclaiming your complex identity! With the help of scholars, curators and artists from Monash University, you are invited to explore and discuss your sense of belonging and family history. How does your Italian identity and family history fit with your life in Australia? How does your identity intersect with matters of class, ethnicity, race, gender, sexuality and disability? How have other Australians of italian background explored their complex identities, through creative practices (e.g. comics, music, film-making, art)? How can young Australians of Italian ancestry become leaders, and contribute to the positive development of their communities? These and other questions will be discussed throughout the workshop. The workshop will be facilitated by Francesco Ricatti and Rita Wilson with contributions from Matteo Dutto, Salvatore Rossano and Katrina and Gracie Lolicato. The workshop will be video recorded. Please let us know in advance if you don't want to be filmed. Free event.